Are you still trying to figure out where to hide all those cables and gadgets? Still trying to figure out how to make your TV set look tidier? An IKEA entertainment center is an easy-to-build, affordable solution. An entertainment center will house your television set, DVD player, stereo system and gaming console in a designated space-saving place. This storage unit (73″ wide and 93″ high) made with AKURUM cabinets from IKEA meant to be used in kitchens has lots of space for all your knick-knacks and gadgets. This is more than a traditional wall unit. It’s a custom unit for all your electronics at the living room. Many suburban American houses have a mudroom, a casual, generally secondary entryway intended as an area to remove and store footwear, outerwear, and wet clothing before entering the main house. You can create an IKEA mudroom with kitchen cabinets. A mudroom is a homeowner’s best friend in winter. The perfect place to stash boots, coats, hats and mittens, a mudroom is the hardest working room in the house. But what about the other three-fourths of the year? Mudrooms can act as a family launch pad, a sort of headquarters, if you will. A place where all the necessities for heading out the door can be located in one convenient spot. Check out our IKEA mudroom made with ABSTRAKT white high-gloss wall cabinets and a NUMERAR black with a metal-effect edge. We left open cabinets at the top for smaller items that we usually carry and leave at the entrance: purses, lunchboxes, gym bags, etc. Wall cabinets installed on top of the counter simulate a tall cabinet unit and keep bulkier items like winter coats stored out of sight. Lower cabinets create a nook for seating and space that can be used to store boots and shoes. TJUSIG racks were included for scarves, umbrellas and lighter coats and sweaters. They are easily accessible when you need to leave your home in a hurry. High-gloss doors in ABSTRAKT white were matched with FINTORP black handles for a modern, clean look. A stainless steel PERFEKFT plinth/toe-kick was used to frame the mudroom unit and make it stand out. Sometimes all it takes is a one simple change to update an IKEA bathroom vanity. We are showing you an example of how to go from a transitional bathroom vanity to a modern-looking bathroom. All this while keeping the same overall look. The difference is only $201.00. IKEA vanities can be designed with AKURUM cabinets. 3 Standard kitchen base cabinets: 30″ wide, 34 1/2″ high, 24″ deep. 2 Custom open cabinets: 15″ wide, 34 1/2″ high, 24″ deep. Plinth (toe-kick) and 2 PERFEKT cover panels for base cabinets. Custom cabinets at both sides can be used for laundry hampers, towels, etc. 3 Standard kitchen wall cabinets: 30″ wide, 24″ high, 24″ deep. 2 PERFEKT cover panels for base cabinets cut down to size. No plinth (toe-kick). “Floating” installation. There’s no need to customize all cabinets for this modern IKEA vanity. Just use 24″ deep wall cabinets. All we did was removing the toe-kick! 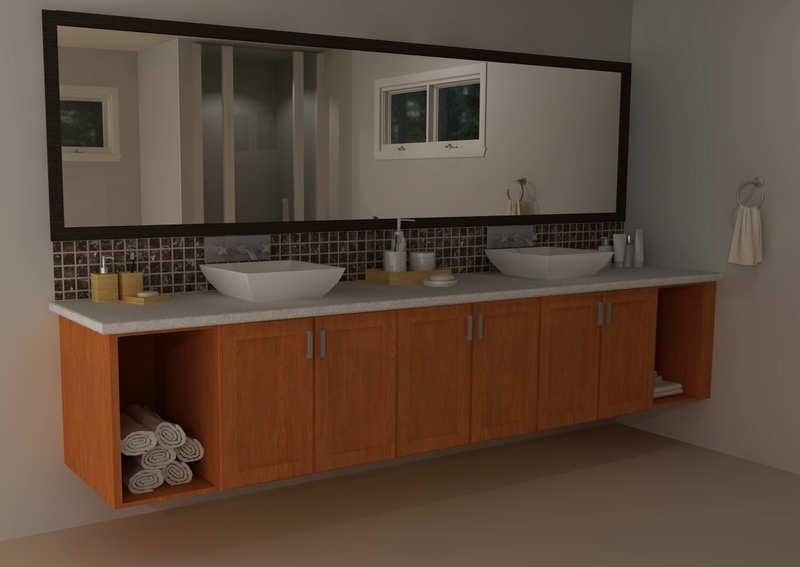 This vanity was designed with standard AKURUM kitchen cabinets from IKEA and a bit of creativity from our designers. You get a very custom look without customizing much. Installation tips from our designers: Whenever possible, use a lighter material for your countertop and avoid granite. If this is not possible, you’ll probably need to use additional steel supports for the back of your cabinets and look for your wall studs for a better reference of where to use them. Make sure your contractor takes a closer look to identify which parts to use for your wall material.